The crossbow competition in Massa Marittima is one of the brightest, most unforgettable events which revive the history of Tuscany. The Italian name for the holiday is “Balestro del Girifalco”. Balestro del Girifalco recreates medieval traditions in a very picturesque way. The feast starts with a pageant of standard-bearers. 150 people wearing luxurious velvet costumes take part in the procession. The colorful performance of standard-bearers on the Cathedral Square, Piazza del Duomo, culminates the festive pageant. After it, the crossbow competition begins. 24 crossbowmentake part in the contest. 8 participants represent each of the three old districts of the town called terzieri. Crossbows used in the historic performance were accurately made by the sketches of the 15th century. The target, which the crossbowmen are to strike, has a rather unusual shape. The base is a circle 50 centimeters in diameter. A wooden cylinder with a diameter of 13 centimeters is placed in its center. It projects for 42 centimeters. The arbalesters are to strike the target from the distance of 36 meters. The winner of the Balestro del Girifalco competition is awarded with hand-painted silk cloth. A special award has been established since May, 2005. The crossbowman, who will become the winner of the Balestro del Girifalco contest three times during a decade, will receive it. The Balestro del Girifalco competition is held twice a year, on the fourth Sunday of May, and on the second Sunday of August. Both dates are symbolical. The May contest is dedicated to St Bernardino Day, which is celebrated on the 20th of May. He is the patron saint of the town. 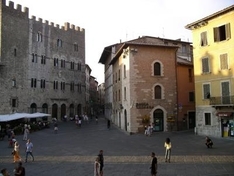 The August contest alludes to the date when Massa Maritttima got the status of a self-governed town in 1225. Massa Marittima invites you to the fascinating holiday. Massa Marittima is an excellent example of Middle Age town-museum. A lot of impressive constructions of the XII -XIV centuries have been retained in this town. Massa Marittima was founded by the Etruscans and gained its prosperity in the XI century.